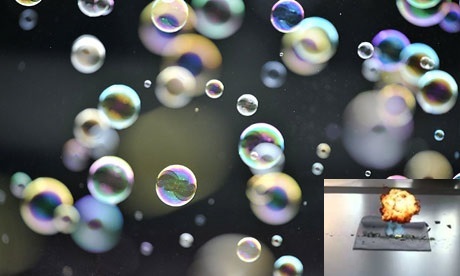 University of Nottingham > Blogs > INNOVATE - Novel Aerospace Technologies > Aerodynamics > Explosive bubbles: Is it really the future of subsonic flow control? Concerns over global climate change have prompted many countries to re-think about the concept of transport. Indeed, it is of primary importance to reduce impacts of transport on the environment. This is no different for the aerospace industry, which is particularly focused on the idea of greener aircraft, due to the level of fuel consumed by aircraft and the resultant emissions of carbon dioxide and other greenhouse gases (GHG) into the atmosphere. As a matter of fact, a ‘short-haul’ flight produces as much as three times the GHG emissions per passenger mile, compared to using a car. Despite various attempts to realise a commercial hybrid aircraft, traditional gas turbine airplanes are still considered significantly reliable and cost-efficient. Moreover, the optimisation of the aircraft aerodynamic performances is still regarded as being of paramount importance. It is here that flow control comes to the stage! Indeed, original and innovative flow actuator methodologies are being developed. The target for the aerospace industry is to achieve the largest effect on the flow field – in terms of skin friction reduction and mitigation of flow separation – with the minimum amount of energy required. At the same time, the actuator transient should be small enough, in order to assure a fast real-time response. As a matter of example, smart wind turbines have already benefited from Dielectric Barrier Discharge (DBD) plasma actuators. In fact, the primary effect of these devices is to virtually modify the aerodynamic shape of each blade, in order to increase the wind turbine capability of “capturing energy”, and to reduce the noise emissions, at the same time. Another actuation philosophy is represented by synthetic jets (SJ), produced by a periodic cycle of ejection and suction of fluid through small orifices. Depending on the cycle frequency and amplitude, these devices can successfully introduce vortex motions of different size and phase in the flow field. However, both DBD and SJ can only produce flow field perturbations which originate from the body wall – for instance the aircraft wing surface. Thus, they would take “some time” to reach the larger vortex structures, located outside the boundary layer. These motions, namely the hairpin eddies, are peculiar for their persistence in time and space. Moreover, as observed in many studies, the pattern of these structures tends to stretch itself within small pitch angles, down to the near-wall region of the boundary layer. 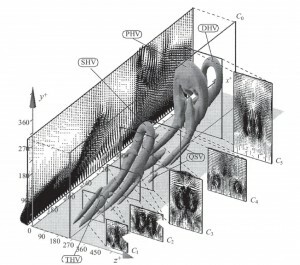 Direct numerical simulation of turbulent channel flow. 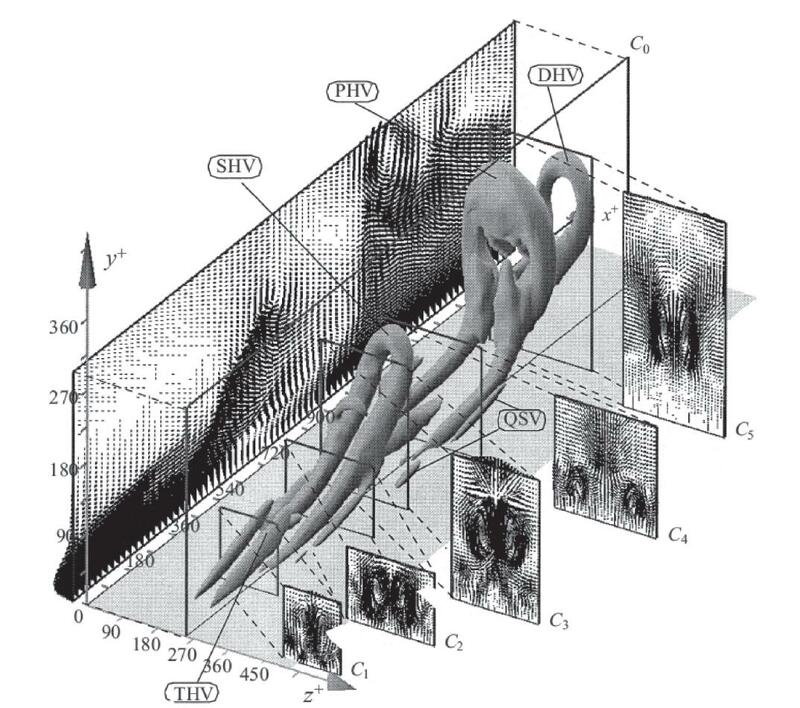 Distribution hairpin vortices along the stream-wise direction (Zhou et. al 1999). Hence, there must be a correlation with the wall skin friction distribution! In effect, the main idea spreading among fluid dynamicists consists of controlling the wall skin friction – difficult so far because of the high-frequency velocity fluctuations – by simply disrupting the outer hairpin vortices – which evolve far more slowly. Currently, very few techniques are available. One of these is laser energy deposition. As mentioned on the previous blog post, this method is particularly effective within supersonic regimes. In fact, its primary effect is the formation of a system of shock waves which evolve in very small time and space scales, and which interfere with the shocks forming naturally around the body. As a result the heat flux distribution would be affected. Hence, in order to adapt remote flow control to subsonic regimes, a medium to transport energy into the flow field is necessary. This sort of energy carrier, should also release its content locally and in small time scales. How about explosive bubbles floating in air? In fact, soap bubbles are the simplest and easiest way to transport chemical energy into the flow field, without significantly affecting it. However, one more ingredient is still needed to definitely induce a micro explosion. Which agent could activate an exothermic reaction, without affecting the surrounding flow field? The answer is obviously coherent laser light. What is more, according to the laser wavelength and power used, several exothermic reactions can be targeted, including photosensitive, free-radical ones. However, a fundamental constraint to build such a flow actuator is its reliability. In other words, how easily can the reaction occur? Several tests have been carried out at The University of Nottingham’s laboratories, on small bubbles filled with flammable gas and ignited by using green laser light – at 532nm. In this way, the gas contained inside the bubble is brought up to its flashpoint. However, due to the arduousness of focusing the laser light in a tiny spot – order of tenths of nanometres – hence depositing its energy, this process has revealed itself not very reliable. 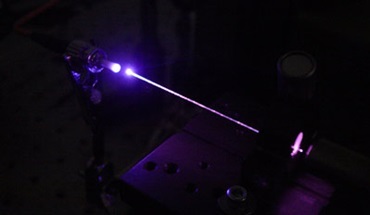 Thus, a photosensitive, free-radical reaction could represent the best substitute, due to the very fast response after the first laser pulse, and its higher reliability – in terms of the occurrence of the reaction. In order to achieve this result, coherent light, within the UV range, should be contemplated. By the same token, the laser light should also be focused in a small spot, not really to deposit energy in air; it should rather localise the effect of the beam light to the region of interest. UV laser light focusing on a small spot (newqyresearchgroup.tumblr.com). The research which I have conducted as part of the INNOVATE project will help to better understand how to reduce the most considerable component of the aerodynamic drag force – the friction with air – which aircraft (likewise cars, trucks, etc) have to tackle every day. An improvement in the aircraft aerodynamic performances would reduce fuel consumption, and contribute to the reduction of aviation’s current levels of carbon emissions into the atmosphere. In case the readers are interested about the answer to the question in the title of this article, please make sure not to miss the next blog on remote flow control, where further updates will be presented!